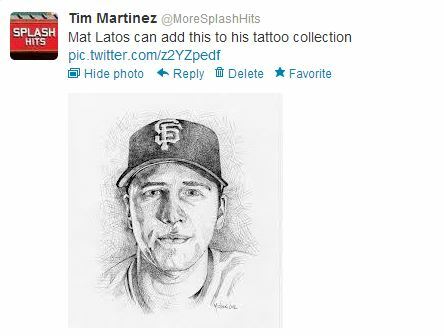 A couple of years ago I launched to Twitter account linked to my MoreSplashHits blog. Then I started using Twitter as I watched Giants games live, and it was great. It’s kind of like hanging out in the bleachers at AT&T Park or a sports bar filled with Giants fans. So I thought I’d share with you my impressions of the Giants’ series victory over the Reds through my tweets during the five games. Johnny Cueto injures himself in the bottom of the first inning, draw some cheers from AT&T crowd. Bronson Arroyo was shutting out the Giants through six innings as Reds led 4-0. When TBS made the obligatory replay of the Scott Cousins/Buster Posey play in 2011 while the Reds were pounding the Giants. Which was quickly followed by.. The Reds add onto their lead in the eighth against Guillermo Mota. After the Reds extended lead to 9-0. Yet, I never lost hope … completely. After the loss, trying to keep things in perspective. Giants score first run since Game 1 on HBP, walk, sacrifice bunt and sacrifice fly. Giants’ inability to get runs (or even hits) heightens stress when Reds come to plate. … and it begins to deteriorate confidence. Brandon Phillips battled a cramp in his leg while batting. After the camera showed Johnny Cueto in dugout. 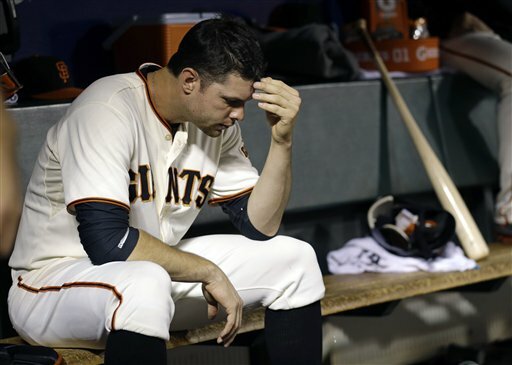 After Bruce Bochy all but empties his bench in eighth inning. Still 1-1, bottom of the ninth, Reds hitting. Top of the 10th, Giants put runners on second and third with two outs after passed ball with Joaquin Arias at bat. They pitch to him. He hits chopper to Scott Rolen, who can’t handle it as Arias beats out throw. Buster Posey scores for 2-1 lead. Romo saves. Giants win 2-1. I get a late start. 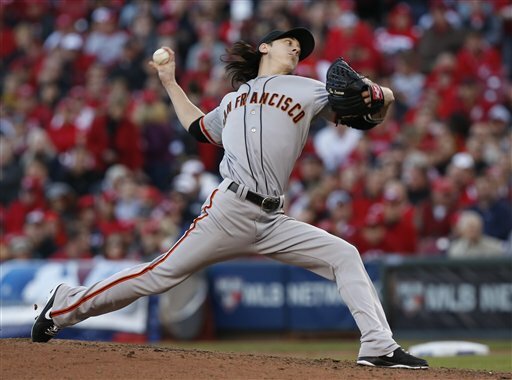 Tim Lincecum comes in relief of Zito, fans Ryan Ludwick to end inning. Giants surge ahead. Geico commercial comes on TV. After State Farm ad comes on featuring ex-Cubs Kerry Wood and Andre Dawson. Another clutch hit from Marco Scutaro. Giants score eight runs, even series at 2-2. Camera shows Brian Wilson and his beard in dugout. Buster Posey belts a grand slam to make it Giants 6-0. Reds cut the lead to 6-3 and keep threatening. As the stress grew in late innings, the Tweets became fewer and fewer and far less clever. But the Giants held on the victory and advance. So I offered praise to Hunter Pence and his pre-game pep talks in Games 3, 4 and 5. Game 3: Giants 2, Reds 1, 10 inn. 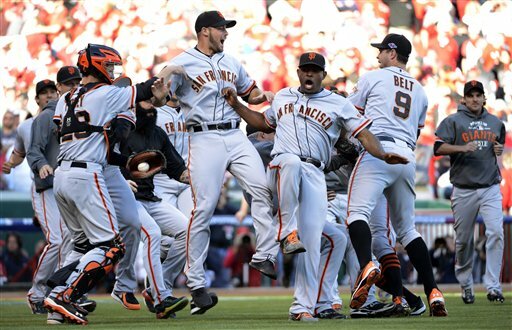 The San Francisco Giants made history Thursday, and I have only one thing to say about that. Only the Giants can make a 6-0 a heart-thumping affair. That’s where the Giants were since stinging Mat Latos for six runs in the fifth, the killer blow being Buster Posey’s grand slam that made it 6-0. Well, we thought it was a killer blow. It was just a wounding blow. The Reds did not go down with a fight. BOTTOM OF FIFTH: But the Giants didn’t get a shutout inning from Matt Cain. Ryan Hanigan was hit by a pitch and Drew Stubbs singles. One out later, Brandon Phillips doubles both home. But Cain ended it there. GIANTS 6, REDS 2. BOTTOM OF THE NINTH: Romo gets Phillips to pop out. Then Zach Cozart walks and Votto singles to right. Ludwick singles to left, scoring Cozart. Runners at first and second at one out. Bruce comes up and hits so many foul balls you had to runner if they would run out of balls. Finally, Romo gets Bruce to fly to left. Romo gets ahead of Scott Rolen 1-2 before a slider — that actually missed on its location — gets Rolen to strike out. GAME OVER. GIANTS 6, REDS 4. It was a great game. A great comeback effort by the Reds. Great pitches, great plays by the Giants to preserve the lead. Bring on the Cardinals or Nationals!!! For the 13th consecutive time, the Giants won a game started by Barry Zito. 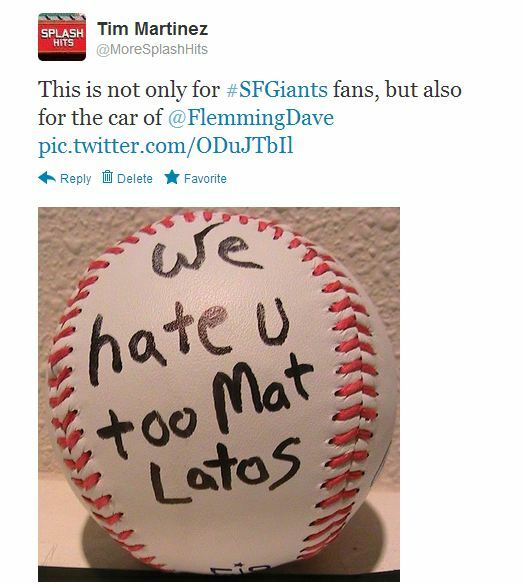 But like in a few other of the Zito’s previous 12 starts, the Giants won not because of him, but in spite of him. Zito exited after 76 pitches in 2 2/3 innings, giving up two run on four hits, four walks. One of the runs the Reds scored off Zito came on three successive walks. George Kontos came to clean up Zito’s mess in the third. When two Reds reached on infield singles in the fourth, Jose Mijares got Joey Votto, then Tim Lincecum entered. This was the Tim Lincecum from Sunday’s game. The Tim Lincecum of the 2010 playoffs. The Tim Lincecum of the 2008 and 2009 Cy Young seasons. Lincecum pitched 4.1 innings, giving up one run on two hits with no walks and six strikeouts. He threw 55 pitches, 42 for strikes. That goes with two scoreless innings he threw Sunday. 6.1 IP, 1 ER, 3 hits, 0 BB, 8 K. 80 pitches, 59 for strikes. If you compare that line with any of Lincecum’s starts this season, in some ways there’s no comparison. Number of Lincecum starts this season with zero walks? None. Number of Lincecum starts in which Lincecum allowed three or fewer hits: Three. But in all three, he walked four. So what’s the difference between Lincecum start and Lincecum out of the pen? Timmy didn’t really say. On the flip side of the game, the Giants’ offense finally woke up. For a team that had four runs on 10 hits in the first three games, the Giants broke free for eight runs on 11 runs on Wednesday. Home runs from Angel Pagan in the first and Gregor Blanco in the second gave the Giants’ an early 3-1 lead they would not relinquish. In the seventh, Pablo Sandoval launched a long, two-run home run that measured an estimated 422 feet to seal the deal. I didn’t see where it landed, but it was headed to the Ohio River. Since this is MoreSplashHits, we celebrate splash hits, even near splash hits on the road. Now the Giants have become the first NL team to fall behind 2-0 in the Division Series to force a Game 5 by winning two road games. They’ve already made history once, why not do it again, by becoming the first NLDS team to advance after falling behind 0-2. Incredibly, inexplicably, the Giants are not dead yet. Buster Posey scored on an error by Reds third baseman Scott Rolen, who could not field a grounder off the bat of Joaquin Arias cleanly enough to throw him out with two out in the top of the 10th. And the Giants won 2-1, despite the fact that they didn’t record their first hit until the sixth inning, despite the fact that they only managed three hits total, despite the fact that in seven of the 10 innings Tuesday the Giants went down in order, despite the fact that the Giants did not get a run-scoring hit. The Giants still aren’t hitting, but they’re still playing. They won because of a solid five outings from Ryan Vogelsong and five more shutout innings from the bullpen. It was a very 2010 pitching performance. But it was a very un-2010 performance by manager Bruce Bochy. Watching the game, we kept wondering if the skipper’s questionable move were eventually going to end the Giants’ hopes. Ultimately, it was a questionable call by the former Giants manager in the Reds dugout that helped them win the game. We’ll get to that eventually. But we’ll start with Vogelsong. 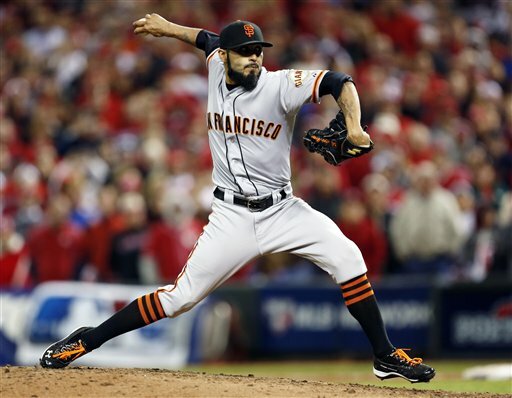 After giving up three singles and a run in the first inning, it looked like it was going to be another sub-par postseason outing by a Giants starter. Vogelsong was actually aided by Brandon Phillips’ decision to advance from first to third on a pitch that got away from catcher Buster Posey. Posey threw out Phillips at third for the inning’s first out. After Zach Cozart walked and a Joey Votto fly out, Vogelsong gave up singles to Ryan Ludwick and Jay Bruce, scoring Cozart. But Vogey fanned Scott Rolen to end the inning. But after the first, Vogelsong did not allow another hit to the Reds. Meanwhile, the Reds’ Homer Bailey didn’t allow a hit to the Giants for 5 2/3 innings. But that didn’t keep the Giants off the board. In the third, Gregor Blanco was hit by a pitch and Brandon Crawford walk. After a Vogelsong sacrifice, Angel Pagan flied to center to score Blanco. From there it was a combination of heroes, botches by Bochy, and goofs by the Reds. BOCHY BOTCH NO. 1: This one came even before the game started, before the series started, when Bochy decided to go with 12 pitchers on his postseason roster. He went with 11 in 2010, when he left Barry Zito off the roster. But this season, he decided to leave all five starters on the roster, meaning one would act as a long man out of the pen, completely negating the need to carry Guillermo Mota. The Giants would have been better off leaving Mota off the roster and carrying Francisco Peguero to give them a second reserve outfielder on the bench. HERO NO. 1, RYAN VOGELSONG: Vogelsong settled down after the first, working around two walks in the third and setting down the final seven batters he faced. He finished with 5 IP, 3 hits, 1 ER, 3 BB, 5 K.
BOCHY BOTCH NO. 2: With Vogelsong sailing and the Giants hitless, Bochy opted to pinch-hit for Vogey with Aubrey Huff leading off the sixth. TBS analyst Ron Darling said Bochy made the move because “the Giants can’t waste outs.” Well, that’s all they have been doing all weekend. The more important goal is keep the Reds from scoring. He should have let Vogelsong hit and stay in the game for another inning. He was at 95 pitches. But his high-pitch innings came early. Instead, Huff came to the plate and struck out. Now your starter is out, you’re digging in your dugout and one of your pinch-hitters is done. Marco Scutato got the Giants’ first hit two batters later. HERO NO. 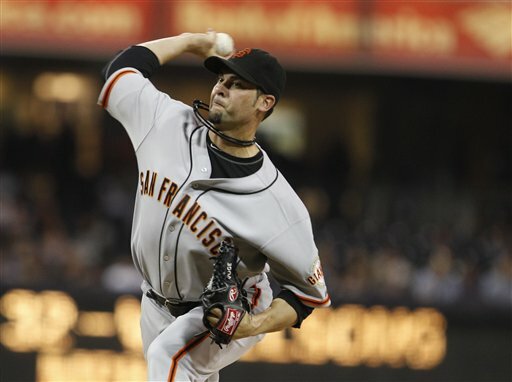 2, JEREMY AFFELDT: Affeldt came in relief of Vogelsong and threw two shutout innings, allowing just one hit. A shutdown performance very similar to Game 6 of the 2010 NLCS in Philadelphia. BOCHY BOTCH NO. 3: When Reds manager Dusty Baker pulled Bailey after seven one-hit innings (and 10 strikeouts and just 88 pitches thrown — thank you Dusty), lefty Sean Marshall came in the game. With two lefties (Gregor Blanco and Brandon Crawford) and the pitcher’s spot due up, Bochy gutted his bench, sending up three pinch-hitters to hit to get the OVERRATED righty-lefty. I can see sending up two pinch-hitters, but not three, especially with only four players left on the bench. The best move would have been to let Blanco hit, keeping Xavier Nady in reserve. Instead, Nady, Joaquin Arias and Ryan Theriot were all retired. HERO NO. 3, HUNTER PENCE: Pence was hitless — for the series — when he came to the plate in the top of the 10th. He fouled off a pitch and landed awkwardly on his left leg, which was cramping up. Trainers came out to talk to him and he stayed in the game, eventually slapping a single into left to put runners on first and second with no out. Pence hobbled to first. In the bottom of the 10th, Pence chugged a bottle of Gatorade and made his way out to right. Luckily, the Reds never hit the ball his way. BOCHY BOTCH NO. 4: OK, I don’t think Bochy actually botched this one, but I thought I should address it. After Pence’s single put runners on first and second with no outs, Bochy did not have Brandon Belt sacrifice. I believe it was the right call. Belt does not have a sacrifice bunt in his two years with the Giants. He hasn’t even attempted one. He has zero sacrifices in three seasons as a pro. With Pence hobbled at first, a bunt attempt that is struck too hard could have easily have turned into a double play. Fans were screaming for a sacrifice after Belt struck out, but in this case it was a good call. REDS GAFFES NO. 1, 2 and 3: After Xavier Nady followed Belt’s whiff with one of his own, Jonathan Broxton’s first pitch to Joaquin Arias ticked off catcher Ryan Hanigan’s glove for a passed ball and both runners moved up. It was at this point that I thought Baker would walk Arias with the open base. This would accomplish three things: 1) set up a force at any base; 2) force Bochy’s hand to use his final hitter on his bench — Hector Sanchez — to bat for Sergio Romo; 3) Get Romo out of the game. Instead, he pitched to Arias, who hit a chopper to Rolen, who charged but was unable to come up with it cleanly and Arias beat out the throw, scoring Posey from third. Romo then came back out in the 10th and set the Reds down in order, completing a six-up-six-down night. Still trying to keep the faith as the Giants prepare to play the Reds in Game 3 of the National League Division Series. But it’s hard given the cold, hard facts about being down 0-2 in the NLDS. 21 teams have fallen behind 0-2 in the NL Division Series since its inception in 1995. None have rallied to win the series. Only one has a team even managed to force a Game 5. That was last year when Arizona won Games 3 and 4 to force a Game 5. However, those two wins came at home for Arizona. Teams falling behind 0-2 in the NLDS are 5-16 in Game 3. Teams falling behind 0-2 with two losses at home are 2-6 in Game 3s on road. The Reds have not lost three consecutive games at home this season. The Giants haven’t swept a series in Cincinnati since 1999. The Giants swept three road series this season: Aug. 3-5 at Colorado; Aug. 20-22 at Los Angeles; Aug. 28-30 at Houston. The last time the Giants won an elimination game on the road was Game 5 of the 2002 NLDS in Atlanta. But, hey, there’s always a time to make history. Game 2 of the National League championship series ended two hours ago, and I’m still trying to find something profound to say about the Giants’ loss. I could write about how Madison Bumgarner was not sharp, as he hasn’t been for the last few weeks of the season, giving up a solo home run to Ryan Ludwick and a single-fest in a three-run fourth inning. I could write about how Hunter Pence’s decision to try to throw out Joey Votto at home — instead of throwing to third — allowed the runners to move up 90 feet to second and third. If he had held the runners to first and second, then Ryan Hanigan’s single to center likely would have been a inning-ending double play to Marco Scutaro and held the deficit to 2-0. I could write about how the Reds added five runs in the eighth off two relievers — Jose Mijares and Guillermo Mota — who should have never been in the game, and maybe not even on the postseason roster. Mijares was brought in after Tim Lincecum threw to solid innings to face lefties Joey Votto and Jay Bruce. Votto singled and Bruce doubled with a Ryan Ludwick walk sandwiched in-between. But that didn’t really matter either. The bottom line was that the Reds were good enough Sunday to score one run. And that’s all they needed against a Giants lineup that seemed to be pressing from the start, and it only got worse as the game wore on. And you can’t win a game if you don’t score a run. The end result was the worst shutout loss in the postseason in franchise history, their first shutout postseason loss since being one hit by the Mets’ Bobby Jones in Game 4 of the 2000 NLDS, and their most lopsided postseason loss since losing Game 5 of the 1951 World Series 13-1 to the Yankees. Here are the hitting highlights of the weekend. How are those for “highlights.” The lowlights included: Other than that, it wasn’t pretty: Angel Pagan 1 for 9, Marco Scutaro 0 for 8, Hunter Pence 0 for 8, Brandon Crawford 0 for 4. When you look at this lineup, it hardly resembles the line-up of the 2010 champions. Only Sandoval and Posey were on that team, and Sandoval was mostly on the bench in 2010. We’ve seen what happens when this team presses. The Giants managed just two hits in the first five innings Saturday before Posey belted one out. After hitting some balls hard for outs in the first inning, the Giants couldn’t hit the ball out of the infield off Bronson Arroyo Sunday until Belt’s two-out single in the fifth. That broke up a perfect game. And the Giants didn’t manage much after that. Tim Lincecum was outstanding in his two innings of relief, allowing only a Brandon Phillips double while striking out two. Lincecum pitched out of the stretch the entire time, and appeared to pitch angry … possible frustrated at being skipped over for a starting assignment in this season. It’s that attitude — that focus — he’s seemed to be missing at times this season. It could have also been that pitching out of the pen, he wasn’t pacing himself. That allowed him to get more on his pitches. Santiago Casilla got the only batter he faced out in the eighth, but was quickly relieved by manager Bruce Bochy. The Giants announcers suspected the skipper saw a drop in velocity from Casilla, and got him out of the game. Mota came in, and the Reds tallied more runs. George Kontos again had a solid outing, inducing an inning-ending double play that kept the Reds from adding on more runs on Bumgarner in the fifth.